One of only five extant copies. In 1847, Frederick Douglass, discontent with his fee for the popular articles he wrote for William Lloyd Garrison's The Liberator, asked for a raise, from $1.00 to $2.50 per piece. Edmund Quincy, editor of The Liberator in Garrison's absence, wrote of Douglass's request, "Talking of unconscionable niggers, I wrote to Douglass to ask him what he should consider a fair compensation for the letters [articles] that he proposed he sh'd write for the Standard [The Anti-Slavery Standard]. In due time I rec'd and answer saying he should think two dollars and a half about right. I consulted Wendell [Phillips] about it & he thought we had better not beat him down; but tell him that $1.00 was as much as we could afford." (McFeely, William S. Frederick Douglass, page 147). It was clear to Douglass that there were white abolitionists who placed their own position as the self-appointed standard-bearers of social justice above the interests of the famed African-American fighting for social justice. And so that fall Douglass moved to upstate New York to publish his own abolitionist newspaper, The North Star. Before leaving his home in Boston, however, Douglass took with him an unknown number of copies of the sheets for the Boston Anti-Slavery Society's 1847 printing of his Narrative of The Life of Frederick Douglass, An American Slave (first edition 1845). Once established in Rochester, he had them bound up with the North Star imprint, as seen above. 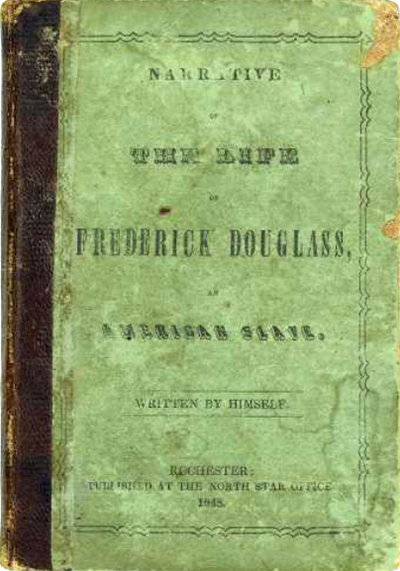 Only five copies of Douglass's Narrative with The North Star imprint are known to have survived: two in private collections, a defective copy found in a dealer catalog, one located at the New York Historical Society, and the present copy recently offered at Swann Galleries Printed & Manuscript African-Americana sale where it was estimated to sell for $18K-$22K. It sold for $31,200, including premium. Douglass earned this bonus albeit too late to take to the bank and enjoy it. DOUGLASS, Frederick. Narrative of the Life of Frederick Douglass, an American Slave, Written by Himself. Boston: at the Anti-Slavery Office, 1847 - Rochester: Published at the North Star Office, 1848. Demi-8vo. xii, [xiii]-xvi, -125 pp. Original roan-backed printed paper-covered boards; some discoloration and a few abrasions to the front board tips; considerable foxing throughout; early ownership in pencil of "John H. Jones, 1848" and a few repetitions. Lacking the frontispiece portrait of Douglass, as do all other copies examined. Image courtesy of Swann Auction Galleries, with our thanks. Emory University also has a copy which Swann apparently failed to locate so there are in fact six known copies.